Even though the ground is white and the plants are dormant, we know there are many gardeners out there who are looking forward to the greener days ahead. Whether you are anxiously flipping through your seed catalogues, pinning gardening ideas on Pinterest or planning out your gardens on paper, a gardener’s mind is never truly dormant, regardless of temperature or weather. Taking the time to plan what you are going to grow and what you will need to have to create a beautiful and bountiful garden this growing season is an absolute must for gardening success. Why not try to grow something this year that you have never tried before? Try adding in a new vegetable to your vegetable garden or a fruit tree or shrub to your property. Not only will this provide yourself and your family with a healthy and affordable food resource, it is also a great way to learn through doing while staying active close to home. The cold days of winter are here again. Bundling up is a definite must. But why not take advantage of winter this year and the many great opportunities available to you throughout town such as a stroll along the Big Block Walk downtown, or go out and enjoy a skate on ‘A’ Place to Play outdoor skating surface that is open daily, weather permitting, on the corner of Victoria Street and Maple Avenue. Did you know the Four Fathers Library, YMCA, and the Stadium Recreation office offer snowshoes FREE of charge for daily and weekend sign outs? Snowshoeing is a great way to explore the outdoors on top of the snow throughout our many parks and along our walking trails. Don’t forget to include your four-legged friends in winter activities as well, at our off-leash dog park located at Dickey Park at 132 East Pleasant St. This is always a busy time of year for the Amherst Stadium, whether on the walking track or on the ice. Are you an adult and wanting to learn how to skate? 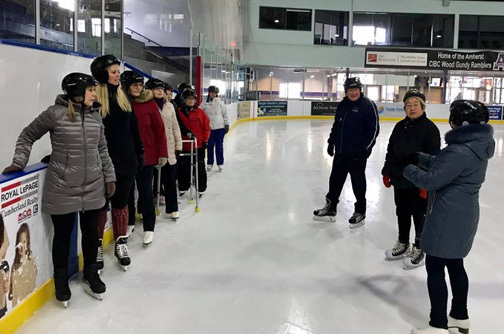 We are happy to offer a free, Adult-Learn-to-Skate program, which takes place on Tuesday’s at 12:15 p.m. Bring a friend, learn a new skill and stay active on your lunch. CSA-approved ice helmets are required when on the ice. They can be borrowed from the stadium office. Our After the Bell program has begun. It runs Monday, Wednesday, Thursday and Friday from 2:45 p.m.- 3:45 p.m. with skating, shinny and /or ringette. Please see the stadium calendar on the Town of Amherst website or follow us on the Amherst Recreation Facebook page for updates and details on more of what’s going on at the Stadium. Saturday, Jan. 26, Eastlink will be at Amherst Stadium televising as the Amherst Junior ‘A’ Ramblers take on the Pictou County Crushers. The Town of Amherst is seeking partners to participate in its Winter Carnival, which takes place February 12-18, and is encouraging all to join us in celebrating heart, culture and play. Activities that will be returning to the schedule this year will be, the outdoor skating party, Chili Challenge, Outdoor Play Day, swimming and more. On Wednesday, Feb.14, as part of Winter Carnival come on out and enjoy a night of laughs. Tickets are $15 per person and are available for purchase at the Town Hall, Simply for Life or at Bliss Café, located inside Dayle’s Grand Market. Online tickets can be found for purchase via the Amherst Recreation Facebook event page. Included with your ticket purchase is the choice of a decadent dessert with tea or coffee. There will also be a cash bar available onsite. Doors open at 6 p.m. at the Community Credit Union Business Innovation Centre. Show starts at 7 p.m. Learn what is happening around the community by visiting our free community events listing and follow us on Facebook and Twitter.